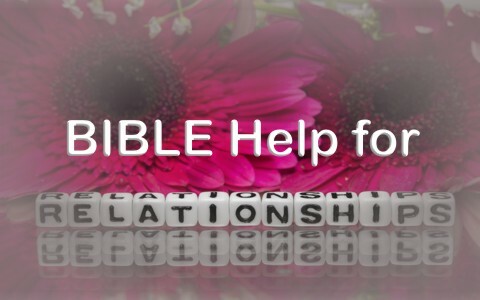 Here are 5 places that you can look to in the Bible for relationship help. I have learned more from being corrected than I ever have from believing I was correct. Your real friends will tell you the truth but those who aren’t really your friends will flatter you. The problem with the latter is that you won’t ever grow in that relationship and the possibility of personal growth will be lost. The Bible is clear that “Faithful are the wounds of a friend; profuse are the kisses of an enemy” (Prov 27:6). How are wounds faithful? Your friends are faithful because they are not afraid to offend you in order to correct you but the kisses (or false flattery) of a “friend” who may actually be an enemy with their “profuse” or many kisses. The psalmist puts it well when he writes “Let a righteous man strike me–that is a kindness; let him rebuke me–that is oil on my head. My head will not refuse it, for my prayer will still be against the deeds of evildoers” (Psalm 141:5). I know this sounds harsh but if I had poor eyesight and I was headed for a cliff, I would want someone to warn me instead of flattering me by saying, “all is well” which is why Solomon wrote “Blows and wounds scrub away evil, and beatings purge the inmost being” (Prov 20:30). Truly “The heartfelt counsel of a friend is as sweet as perfume and incense” (Prov 27:9). Even though the Word of God cuts like a knife, it cuts in order to heal (Heb 4:12). The Bible is clear that God has joined both man and woman together in holy matrimony. Marriage is a God-ordained institution and He created it. It was not man’s idea as we read in Genesis 2:18 “It is not good that the man should be alone; I will make him a helper fit for him” and so “the Lord God had taken from the man he made into a woman and brought her to the man” (Gen 2:22). The word “made” is literally “built” so man and woman were made from the same thing. “Then the man said “This at last is bone of my bones and flesh of my flesh; she shall be called Woman, because she was taken out of Man” (Gen 2:23) “Therefore a man shall leave his father and his mother and hold fast to his wife, and they shall become one flesh” (Gen 2:24). I would add that a man should leave and cleave to his wife and this also means that he (and she) should leave their families out of their new family relationship. Paul wrote “the husband is the head of the wife even as Christ is the head of the church” (Eph 5:23) and so “wives should submit in everything to their husbands” (Eph 5:24) but the husband must never treat his wife harshly (Col 3:19) because she won’t as easily submit to him. I have not found one wife who refused to submit to her husband who followed this command, “Husbands, love your wives, as Christ loved the church and gave himself up for her” (Eph 5:25) which means that “husbands should love their wives as their own bodies. He who loves his wife loves himself” (Eph 5:28). The bottom line for Paul in all this is that each husband must “love his wife as himself, and let the wife see that she respects her husband” (Eph 5:33). If a husband loves his wife as he loves himself and as Christ loves the church then the wife will have no problem respecting her husband and a husband can easily love his wife as he loves himself and as Christ loves the church if his wife respects him. To a wife, love shows her that he respects her and to a husband, respect shows him she loves him. We seem to become who we hang out with. In other words, if we run around with godless, sinful people, it’s going to rub off on us. It’s inevitable that we become who we associate with. Paul wrote “Do not be deceived: ‘Bad company ruins good morals’” (1 Cor 15:33). This is why we are to “Make no friendship with a man given to anger, nor go with a wrathful man, lest you learn his ways and entangle yourself in a snare” (Prov 22:24-25) and also why the psalmist prayed “Do not let my heart incline to any evil, to busy myself with wicked deeds in company with men who work iniquity, and let me not eat of their delicacies” (Psalm 141:4) since “Whoever walks with the wise will become wise; whoever walks with fools will suffer harm” (Prov 13:20). Solomon warns us that “A violent person entices their neighbor and leads them down a path that is not good” (Prov 16:29) so choose your friends carefully because “A man of many companions may come to ruin, but there is a friend who sticks closer than a brother” (Prov 18:24). Gossip might be one of the most destructive vices in the church today but it can also prove fatal for any relationship. The fact is that “A gossip tells secrets, so don’t hang around with someone who talks too much” (Prov 20:19). I have a few close friends who share with me their innermost secrets, weaknesses and sins because they know I won’t share it with anyone. They can trust me but “A gossip goes around revealing secrets [however] those who are trustworthy can keep a confidence” (Prov 11:13). When I tell them I’ll keep this to myself, they know from experience I mean it. This proves that “A dishonest man spreads strife, and a whisperer separates close friends” (Prov 16:28). To cover or keep something private shows love but to repeat it shows we’re not really their friends at all as it says “Whoever covers an offense seeks love, but he who repeats a matter separates close friends” (Prov 17:9). The Bible is clear that sexual infidelity or adultery is a very serious offense to God. The person “who commits adultery lacks sense; he who does it destroys himself” (Prov 6:23) and even looking at a woman or man with lust in the heart is seen as adultery of the heart by God (Matt 5:28) which is why marriage should “be held in honor among all, and let the marriage bed be undefiled, for God will judge the sexually immoral and adulterous” (Heb 13:4). This is because “Every other sin a person commits is outside the body, but the sexually immoral person sins against his own body” (1 Cor 6:18). This is the one sin that is against the body which is why Paul says “do you not know that he who is joined to a prostitute becomes one body with her” (1 Cor 6:16)? Just as a man and woman become one flesh in joining together in marriage (Gen 2:24) the adulterer is joined and becomes one with the other adulterer. God warns about all who do such things as recorded in Revelation 21:8: “their portion will be in the lake that burns with fire and sulfur, which is the second death”. remain chaste and faithful and abstain from adultery or if you’re single, remain faithful in living a life free from sexual immorality for the Bible is clear that the sexually immoral have “no inheritance in the kingdom of Christ and God” (Eph 5:5b) and again Paul warns “those who do such things will not inherit the kingdom of God” (Gal 5:21b) so “Do not be deceived: God is not mocked, for whatever one sows, that will he also reap. For the one who sows to his own flesh will from the flesh reap corruption, but the one who sows to the Spirit will from the Spirit reap eternal life” (Gal 6:7-8). Read more about relationships here: What Does the Bible Say About Relationships? Previous post: Who Are The 144,000 In The Book Of Revelation? Next post: Should Christians Worry About Being Politically Correct?